Now suppose you think about deploying 300 devices which send data every half a second. What tier should you use and how many units? It is clear that you need to send 600 messages per second so 5 units of S2 will suffice. You could also take 50 units of S1 for the same performance and price. With 5 units of S2 though, you can send more messages. If you want to check out the code (warning: written hastily! ), you can find it on GitHub here: https://github.com/xyloscloudservices/docker-itproceed. It is a simple NodeJs script that uses the Azure IoT Hub libraries to create a new device in the registry with a GUID for the name. Afterwards, the code sends a simple JSON payload to IoT Hub every half a second. Now you can run the containers in Rancher (for instance). I won’t go into the details how to add Docker Hosts to Rancher and how to create a new Stack (as they call it). Alternatively, you can run the containers on Azure Container Service or similar solutions. You really need to think if you want to send data every half a second or second. For our ThingTank Air Quality solution, we take measurements every second but aggregate them over a minute at the edge. 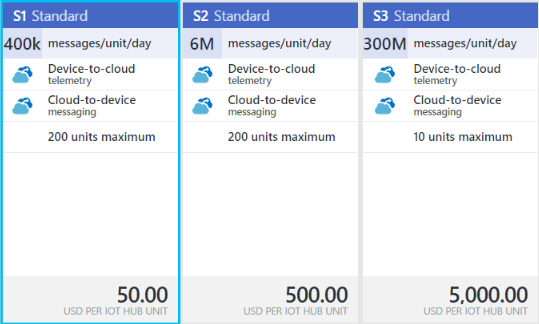 Sending every minute with 5 S2 units would amount to thousands of devices before you reach the limits of IoT Hub!